CarGurus has 21,435 nationwide Enclave listings starting at $3,950. So everyone from urban warrior to rural-route box-holder could use a family oriented full-size crossover, right? Well, Buick is expected to return with its 2015 Enclave lineup in late summer of this year with a few upgrades and refreshments that should please both the warrior and the woodsman. This plus-size people-hauler will return in its traditional three trims (or “groups” in Buick-land) with said versions to include the base Convenience Group, the midlevel Leather Group and the flagship Premium group in defining affordable luxury. The standard 3 rows of seating for 7 via second-row captain’s chairs also return in the latest Enclave iterations, with the Premium Group again remaining eligible for an available second-row bench seat for 8-passenger capacity. Also expected back for 2015 is the relatively roomy 115.2 cubic feet of cargo area that yawns before you when the rear seatbacks are folded down. One thing that remains unchanged for the coming model year’s Enclave stable is the standard (and only) powertrain offering. Expect this hefty crossover to return packing a 3.6-liter variable-valve-timed (VVT) V6 and the capable 6-speed shiftable automatic transmission of yesteryear, with the consequent ability to deliver 288 hp and 270 lb-ft of torque. Towing should remain maxed out at 4,500 pounds with the available trailer hitch and wiring installed, while mileage figures are expected to again come in at an estimated 17 mpg city/24 highway in the standard front-wheel-drive (FWD) iterations. If, however, the possibility of snow and ice and muck is forecast, the 2015 Enclave can be delivered with available full-time all-wheel drive (AWD) to make said inconveniences just a tad more bearable. Look for this crafty crossover in each trim guise to again flaunt a veritable plethora of cabin bling. Depending on the trim selected, be on the lookout for 18- or 19-inch alloy wheels, a roof rack, heated power-adjustable mirrors and a power liftgate outside, as well as cloth or leather upholstery, heated and ventilated power-adjustable front seats and reclining second-row seats inside. Full power accessories, cruise control and telescoping tilt-wheel steering should again be delivered in the entire 2015 Enclave lineup, as should a rear-view camera, rear parking sensors, an auto-dimming rear-view mirror, a remote garage door opener and OnStar Directions and Connections technology interfaced with Bluetooth hands-free calling. Alas, the 2015 Enclave seems not to have been invited to the party where favors include the new 4G LTE WiFi interface. The Leather Group and its swankier Premium Group sibling are expected to offer such additional bling as memory for driver's settings and reverse-tilt outside mirrors, with the Upscale Premium Group also adding a power-folding feature to the outside mirrors. Entertainment-wise, look for lower trims to sport a single-CD player with 6 speakers and satellite radio, while the Premium Group is expected to remain toting its standard Bose premium system with 10 speakers including a subwoofer. All audio systems, by the way, should return interfaced with a 6.5-inch dashboard display screen. In keeping with tradition, lower Enclave trims should once more be eligible for optional items that come standard in higher trims, while upgraded and upsized wheels should again remain available for 2015. Optional touchscreen navigation and a power sunroof also return in the Leather Group and the Premium Group, while the available rear-seat DVD entertainment system is re-situated for 2015 to reduce the incidence of motion sickness for those who can’t do without their daily/weekly/monthly movie fix. Finally, antilock brakes (ABS), traction and stability control, front side-mounted airbags and 3-row head airbags, along with Buick’s unique center-mounted front airbag system all remain standard safety equipment, as do the LED daytime running lights from a mid-2014 refresh. Additionally, turn-signal-integrated mirrors, high-intensity-discharge (HID) headlights, OnStar emergency assistance, a post-collision safety system and a remote antitheft alarm are also expected back for the 2015 Enclave lineup. Meanwhile, look for the top-shelf 2015 Enclave Premium Group to return flaunting standard safety extras like lane-departure and rear cross-traffic alerts, as well as a blind-spot warning system and adaptive headlights. 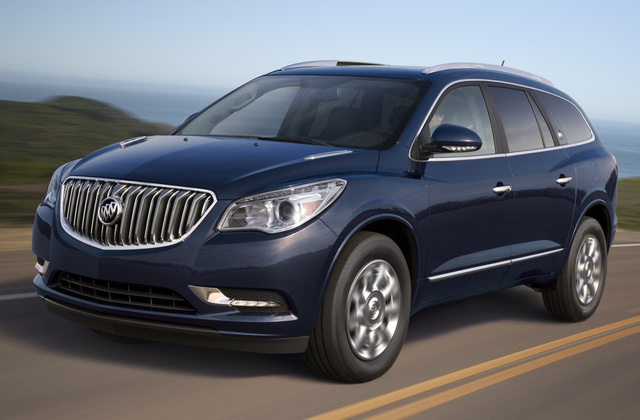 What's your take on the 2015 Buick Enclave? OldEngineer Seems to be a good value. Perhaps should have sliding rear doors, although some would think that would make it look like a minivan; but it would make it easier to open the rear doors in tight parking spots. Should also have 360 (surround) mamera, because of its size. And direct injection and 8-speed transmission, for fuel economy. OldEngineer Seems to be a good value. Perhaps should have sliding rear doors, although some would think that would make it look like a minivan; but it would make it easier to open the rear doors in tight parking spots. Should also have 360 degree (surround) camera, because of its size. And direct injection and 8-speed transmission, for fuel economy. TheHorror I completely agree, OldEngineer! However, many people are too vain to be associated with the minivan stigma. They like to pretend that driving a crossover makes them appear to be hip and adventurous. 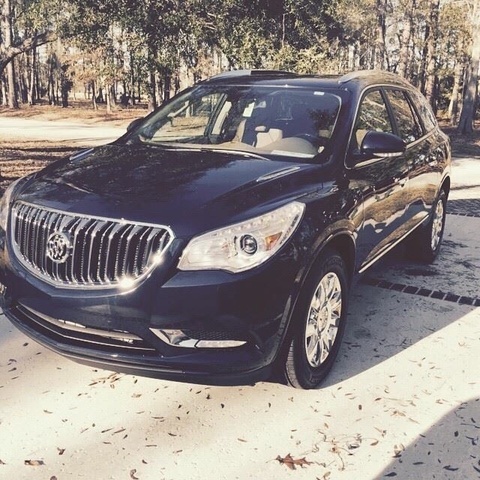 Have you driven a 2015 Buick Enclave? How much does a salvage title affect the price? Can you play a DVD for the kids in the back seat, but still listen to the radio up front while driving? I would like to know how far the passenger and 2nd row seats recline? Can they recline to a comfortable place to se Keep for long distance driving?